"NGCC" redirects here. For the ship prefix, see Canadian Coast Guard Ship. This can be done because heat engines are only able to use a portion of the energy their fuel generates (usually less than 50%). In an ordinary (non-combined cycle) heat engine the remaining heat (i.e., hot exhaust gas) from combustion is wasted. Combining two or more thermodynamic cycles results in improved overall efficiency, reducing fuel costs. In stationary power plants, a widely used combination is a gas turbine (operating by the Brayton cycle) burning natural gas or synthesis gas from coal, whose hot exhaust powers a steam power plant (operating by the Rankine cycle). This is called a Combined Cycle Gas Turbine (CCGT) plant, and can achieve a best-of-class real (HHV - see below) thermal efficiency of around 62% in base-load operation, in contrast to a single cycle steam power plant which is limited to efficiencies of around 35–42%. Many new gas power plants in North America and Europe are of the Combined Cycle Gas Turbine type. Such an arrangement is also used for marine propulsion, and is called a combined gas and steam (COGAS) plant. Multiple stage turbine or steam cycles are also common. CCGT plants have advantages in that the first gas turbine cycle can often be brought online very quickly which gives immediate power, obviating the need for separate expensive peaker plants, and over time the second cycle will start which will improve fuel efficiency and provide further power. In November 2013, the Fraunhofer Institute for Solar Energy Systems ISE assessed the levelised generation costs for newly built power plants in the German electricity sector. They gave costs of between 78 and 100 €/MWh for CCGT plants powered by natural gas. Explanation of the layout and principle of a combined cycle power generator. The heat recovery boiler is item 5 in the COGAS figure shown above. Hot gas turbine exhaust enters the super heater, then passes through the evaporator and finally through the economiser section as it flows out from the boiler. Feed water comes in through the economizer and then exits after having attained saturation temp in the water or steam circuit. Finally it flows through the evaporator and super heater. If the temperature of the gases entering the heat recovery boiler is higher, then the temperature of the exiting gases is also high. In order to remove the maximum amount of heat from the gasses exiting the high temperature cycle, a dual pressure boiler is often employed. It has two water/steam drums. The low-pressure drum is connected to the low-pressure economizer or evaporator. The low-pressure steam is generated in the low temperature zone of the turbine exhaust gasses. The low-pressure steam is supplied to the low-temperature turbine. 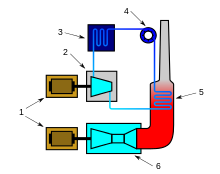 A super heater can be provided in the low-pressure circuit. So a real best-of-class baseload CCGT efficiency of 54%, as experienced by the utility operating the plant, translates to 60% LHV as the manufacturer's published headline CCGT efficiency. The integrated cycle implies that, before combustion, methane (the primary component of natural gas) is mixed with working fluid and converted into syngas (mix of H2 and CO (carbon monoxide)) in a catalytic adiabatic (without an indirect heat supply) reactor by using sensible heat of the hot working fluid leaving, in the simplest case, the gas turbine outlet. The largest part of produced syngas (about 75%) is directed into the combustion chamber of the gas-turbine cycle to generate power, but another part of syngas (about 25%) is withdrawn from the power generation cycle as hydrogen, carbon monoxide, or their blend to produce chemicals, fertilizers, synthetic fuels, and etc. The thermodynamic benefit owing to this modification is substantiated by exergy analysis. There are numerous technological options to separate syngas from working fluid and withdraw it from the cycle (e.g., condensing vapors and removing liquids, taking out gases and vapors by membrane and pressure swing adsorption separation, amine gas treating, and glycol dehydration). Major factors limiting the load output of a combined cycle power plant are the allowed pressure and temperature transients of the steam turbine and the heat recovery steam generator waiting times to establish required steam chemistry conditions and warm-up times for the balance of plant and the main piping system. Those limitations also influence the fast start-up capability of the gas turbine by requiring waiting times. And waiting gas turbines consume gas. The solar component, if the plant is started after sunshine, or before, if there is heat storage, allows the preheat of the steam to the required conditions. That is, the plant is started faster and with less consumption of gas before achieving operating conditions. Economic benefits are that the solar components costs are 25% to 75% those of a Solar Energy Generating Systems plant of the same collector surface. In most successful combined cycles, the bottoming cycle for power is a conventional steam Rankine cycle. It is already common in cold climates (such as Finland) to drive community heating systems from a steam power plant's condenser heat. Such cogeneration systems can yield theoretical efficiencies above 95%. Bottoming cycles producing electricity from the steam condenser's heat exhaust are theoretically possible, but conventional turbines are uneconomically large. The small temperature differences between condensing steam and outside air or water require very large movements of mass to drive the turbines. Although not reduced to practice, a vortex of air can concentrate the mass flows for a bottoming cycle. Theoretical studies of the Vortex engine show that if built at scale it is an economical bottoming cycle for a large steam Rankine cycle power plant. Other historically successful combined cycles have used hot cycles with mercury vapour turbines, magnetohydrodynamic generators and molten carbonate fuel cells, with steam plants for the low temperature "bottoming" cycle. ^ "Levelized cost of electricity renewable energy technologies" (PDF). Fraunhofer ISE. 2013. Retrieved 6 May 2014. ^ a b c d Yahya, S.M. Turbines, compressors and fans. Tata Mc Graw Hill. pp. chapter 5. ^ "Combined-cycle, gas-fired unit costs coming in below expectations: Duke | S&P Global Platts". 2015-08-11. ^ "SSS Clutch Operating Principle" (PDF). SSS Gears Limited. ^ "The difference between LCV and HCV (or Lower and Higher Heating Value, or Net and Gross) is clearly understood by all energy engineers. There is no 'right' or 'wrong' definition". Claverton Energy Research Group. ^ "Siemens pushes world record in efficiency to over 60% while achieving maximum operating flexibility". Siemens AG. 19 May 2011. ^ "Most efficient combined cycle power plant". ^ "Air-cooled 7HA and 9HA designs rated at over 61% CC efficiency". Gas Turbine World. April 2014. ^ "HA technology now available at industry-first 64 percent efficiency" (Press release). GE Power. December 4, 2017. ^ Allam, Rodney; Martin, Scott; Forrest, Brock; Fetvedt, Jeremy; Lu, Xijia; Freed, David; Brown, G. William; Sasaki, Takashi; Itoh, Masao; Manning, James (2017). "Demonstration of the Allam Cycle: An Update on the Development Status of a High Efficiency Supercritical Carbon Dioxide Power Process Employing Full Carbon Capture". Energy Procedia. 114: 5948–5966. doi:10.1016/j.egypro.2017.03.1731. ^ a b Safonov, M.; Granovskii, M.; Pozharskii, S. (1993). "Thermodynamic efficiency of co-generation of energy and hydrogen in gas-turbine cycle of methane oxidation". Doklady Akademii Nauk. 328: 202–204. ^ Granovskii, Michael S.; Safonov, Mikhail S.; Pozharskii, Sergey B. (2008). "Integrated Scheme of Natural Gas Usage with Minimum Production of Entropy". The Canadian Journal of Chemical Engineering. 80 (5): 998–1001. doi:10.1002/cjce.5450800525. ^ a b Granovskii, Michael S.; Safonov, Mikhail S. (2003). "New integrated scheme of the closed gas-turbine cycle with synthesis gas production". Chemical Engineering Science. 58 (17): 3913–3921. doi:10.1016/S0009-2509(03)00289-6. ^ "Fossil Fuels + Solar Energy = The Future of Electricity Generation". POWER magazine. 2009-01-04. p. 1 (paragraph 7). Retrieved 2017-12-25. ^ "ENEL a Priolo inaugura la centrale "Archimede"". ENEL. 14 July 2010. Archived from the original on 25 May 2015. ^ "Yazd Solar Energy Power Plant 1st in its kind in world". Payvand Iran news. 13 April 2007. ^ "Iran - Yazd integrated solar combined cycle power station". Helios CSP. 21 May 2011. Archived from the original on 12 August 2014.